Real tools widening the possibilities of visual. 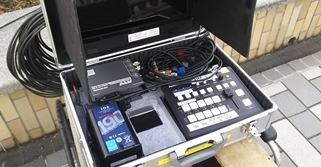 No longer limited to just studios, video equipment is finding its way into an unending stream of situations and venues including applications such as concerts, conferences, signage systems. Now anyone can easily use and enjoy video! To keep pace with this world, we make high quality products easy to use yet at a reasonable price with superb base performance and durability. These are aimed at pro users who need to use high quality equipment on the front lines for all kinds of situations and scenes. "Toei TV Production Co., Ltd."
Mutually converts SDI and HDMI. This converter has an internal frame buffer and supports various frame rate conversions. This cross-converter comes at a low price and supports format conversions.